When you sign up with Apexity you will receive the following information in an e-mail. | Ip: 12.345.67.89 (n) - This is the IP for your account. You may use this IP in your FTP program until your site transfers. | UserName: username - Your Password for Cpanel, FTP, and Frontpage. You must place all documents in the public_html directory of your webspace or they won't be visible to the web. If you would like to upload files before your domain gets transferred substitute the IP number or the specified IP # for the host name in your ftp program. http://Apexity.com/~UserName - Substitute for the Username in the setup e-mail. Substitute the name of your website for "yoursite.com" Use your ftp username and password to access your control panel. Click the "Documentation" link near the bottom of the control panel to access support for your control panel. incoming mailserver: mail.yoursite.com - Substitute the name of your website for "yoursite.com"
outgoing mailserver: mail.yoursite.com - Substitute the name of your website for "yoursite.com"
Again your ftp username / password combination should work. Steps to follow once you can login. 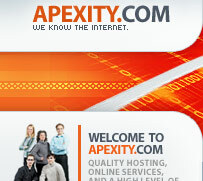 Login to Cpanel by going to http://Apexity.com/cpanel and providing your username / password. Set up your e-mail forwarding by setting a "Default Address" under the e-mail menu. This will route "anything@yoursite.com" to any e-mail address you choose. Set up any specific e-mail forwards you will need. If you need address1@yoursites.com to go to a different e-mail address than address2@yoursite.com set up those forwards, or set them up as POP e-mail accounts with the "Manage Accounts" menu in Cpanel. Design and upload your site. Thank you for choosing Apexity, and good luck with your new website!